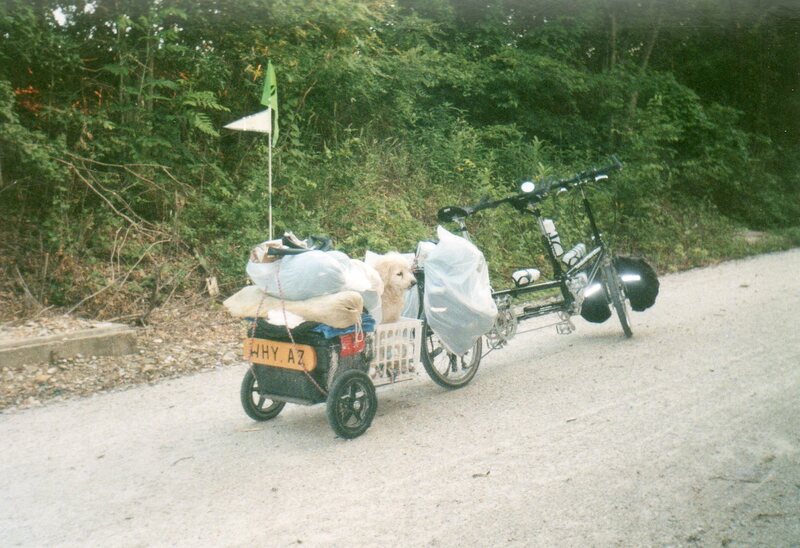 Several years have passed since Barb and I pedaled our Tandem Two’sDay on Missouri’s Katy Trail, a 255 mile long park that never exceeds the width of the old Katy Railroad right-of-way. Because it originally served as a railway nowhere is the grade steeper than two percent. That made it an easy ride until our legs turned to rubber. Our legs wouldn’t have given out so quickly had we not brought too much stuff which included McBark, our 35 pound dog who wanted to accompany us..
On our second evening menacing clouds seemed at treetop level. Rain was a certainty. And there wasn’t a motel we could reach before the sky opened up. However, a nearby sign indicated Clifton City lay to our left. It didn’t look too promising, with several abandoned building crowding against the gravel road. But there was also a large church. With nothing to lose, we left the Katy behind. However, at the crest of the hill we found a service station – Bill’s Place. Bill no longer sold gas. Instead, he provided passersby with beer, soda, coffee and sandwiches. Bill, a retired navy man was full of questions. After a cool soda I asked if he knew where we could find the church pastor. “Why? Are you wanting to get married?” he asked, smiling. We agreed, and then when we saw he was making preparations to close we bought two sandwiches. He’d evidently been sizing us up with his questions, and with keys in his hand he said: “Why don’t you just stay in my store? There’s ham, cheese, lunch meat, sodas. Keep track of what you eat and drink and we’ll settle up in the morning. I’ll be back at six. If you’d start the coffee pot at half past five I’d appreciate it. So we spent the night enjoying Clifton City hospitality. Thanks. Yes, that’s for sure. I think there’s a post in my blog about the brown refrigerator.